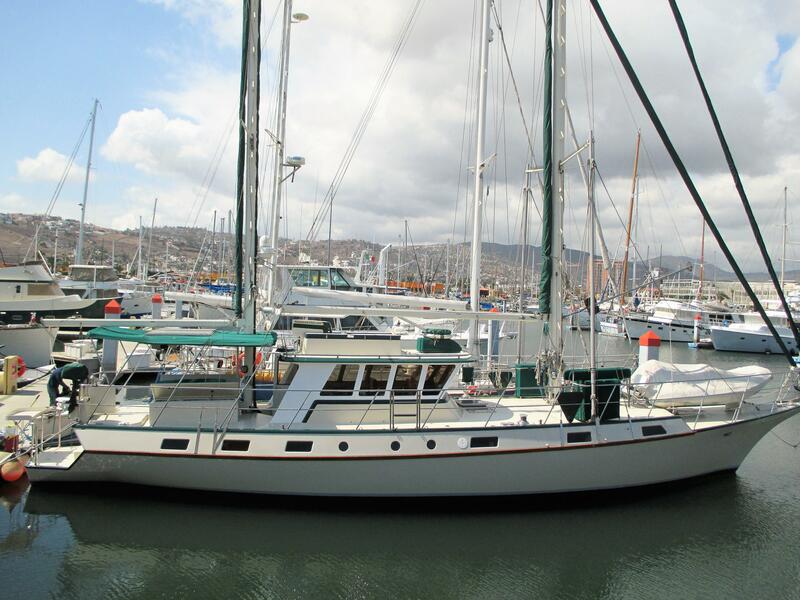 63ft live aboard sailing yacht for sale. This unique blue water Motor sailer was originally a 63ft vessel. With the stern extension/fishing platform added in 2014, she is now 67ft LOA. She is a fine sea going vessel. 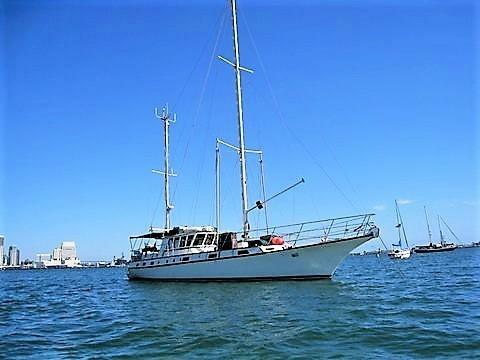 She was designed for world travel and being self sufficient at sea for months at a time. Mo?Chuisle was also designed to function economically. She has a draft of 5ft 3in with the centerboard up and approximately 10ft with it down. She travels at aprox 7.3 Knots @1650rpm. She fuel economy is aprox 3 miles to the gallon giving her an estimated range of 3800 miles in ideal conditions.Her layout was designed through an accumulation of knowledge of a person having over 40 years experience living aboard, working and traveling on the sea. A lot of her features are not available on production model boats. 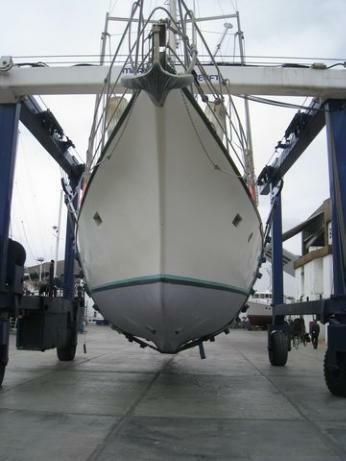 Use of proven systems and quality parts have made her up-keep and maintenance, as easy and inexpensive as possible. Her interior design favors comfort and open living space, trending away from traditional chopped up, cramped, dark living areas many sailboats tend to have. Large skylights in the deck have made the interior bright and well lit naturally during the day. 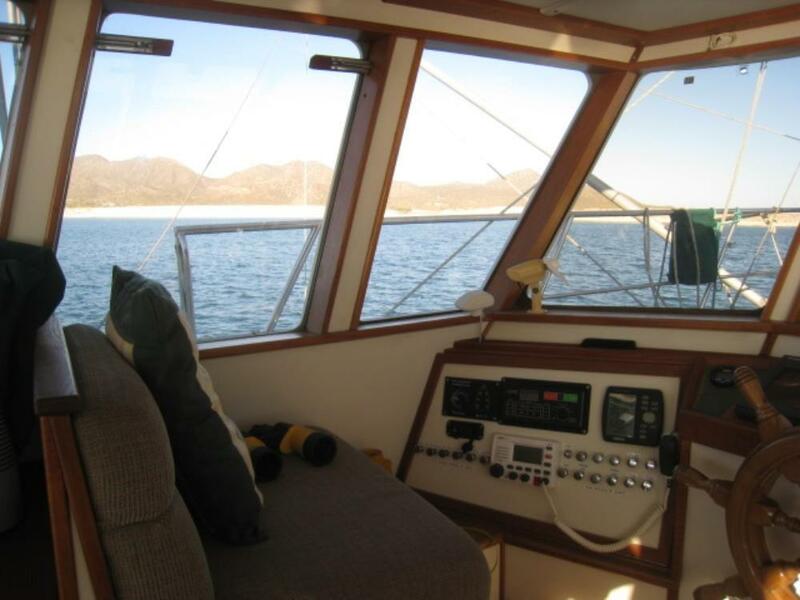 Length at Waterline: 58' 5"
The Pilothouse The Pilothouse is a real asset to Mo’Chuisle. It has 15 windows, 6 of which drop to open for ventilation and a full size opening door. It provides comfort and safety out of the wind and weather, as well as a 360 degree view from the inside. A good place to dine, breakfast, lounge, and socialize, or just hunker down when the weather is unpleasant. 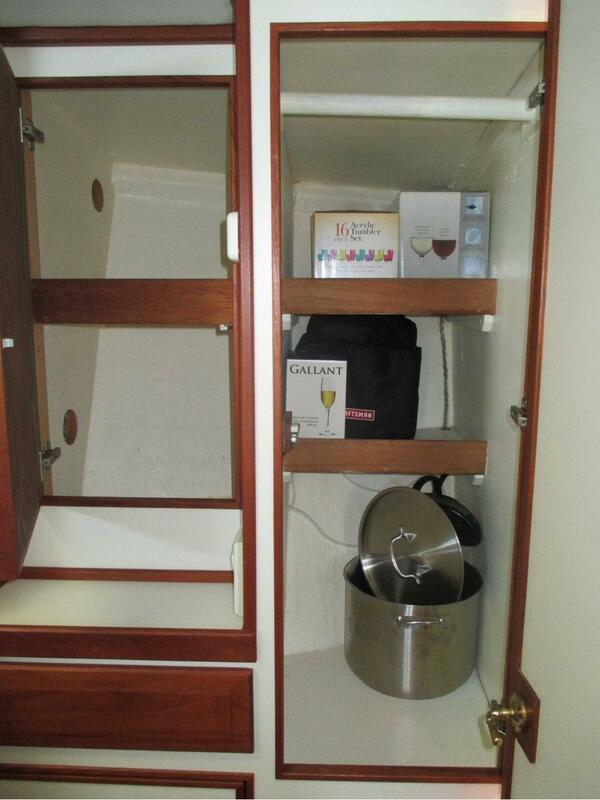 Entrance to the engine room is gained through the galley. 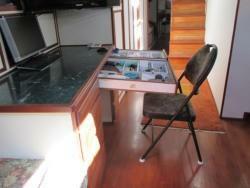 There is a 2ft X 4ft work bench with an aluminum top for easy cleanup. The work bench is equipped with a 4” vice and an 8” four-speed drill press. It has two drawers on sliders below, for tool storage. There is a rack of 10 plastic parts tray/boxes just inside the door. They have been the envy of every boater that has seen them! Above this rack is a Hurricane Hydronic Diesel fired hot water heating system. Above the work bench are two 8” opening port holes.The water maker control panel is at the back of the work bench and there are 4 water system filters (one with a UV Light). These are easily accessed on the left side. 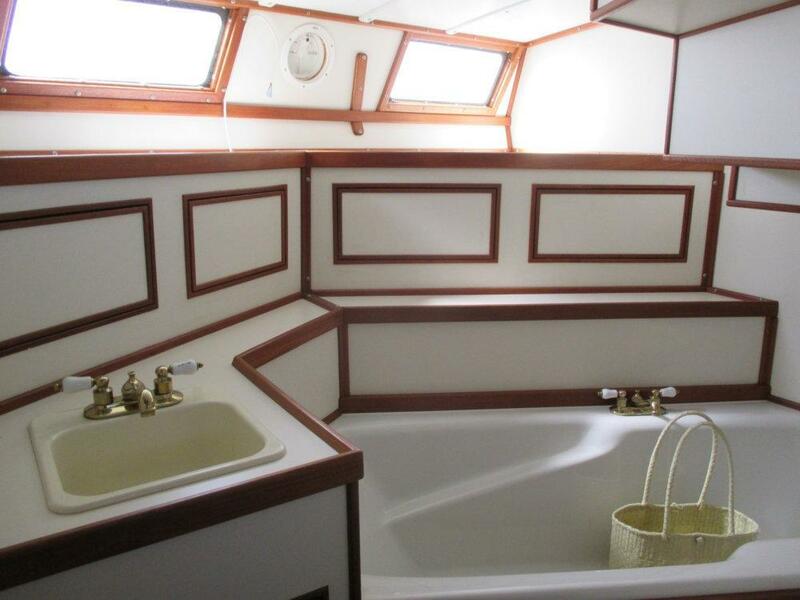 The fresh water pump and valve system are mounted in the corner.On the starboard side as you enter the engine room, there is the main electrical panel and breakers. Aft of this panel is a door/escape hatch giving access to the pilot house.Below the floor as you enter is the water-maker, accessed though two lifting hatches.Directly aft as you enter, below the work bench is the Northern Lights 6KW generator cupboard. Above which is the generator control panel and the shore-power isolation transformer. To the left is another rack of 4 plastic parts tray/boxes then a cupboard for spare belts. On the starboard wall are two Heart Freedom 2500 watt inverters, next to them forward is a Dry-Zones dehumidifying system. In the center is the main engine box. Above which on the forward bulkhead there is a Dual Racor 1000FGX filter system, a Purifiner TF 24P oil management system, a Monarch BE-S33 waste discharge pump and a Walbro diesel pulse pump, for priming the main filters and fuel system. 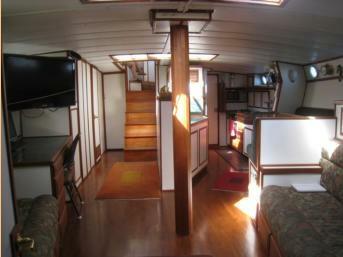 The main saloon has two sofa coches one to each side, they can be used as full size berths. There are storage drawers beneath each and additional storage behind the seat backs. both seats have a good viewing angle to the 40" TV. 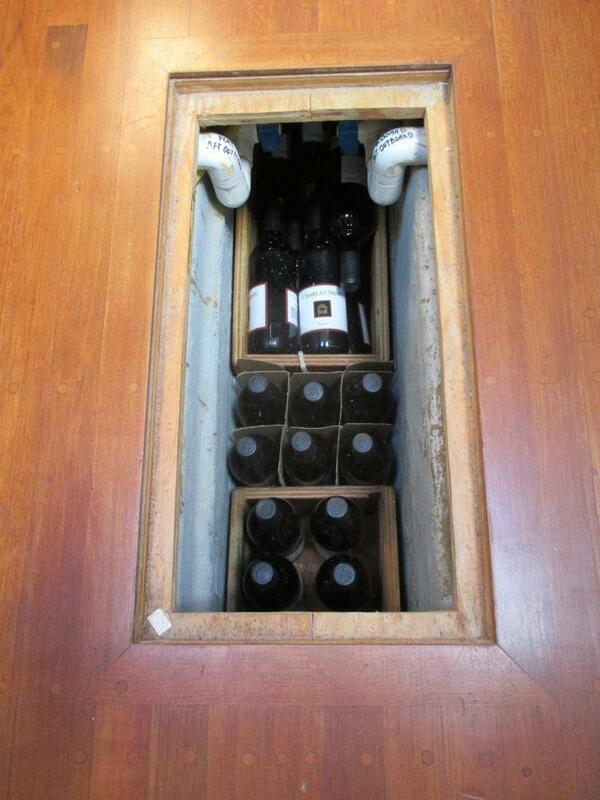 The floors is laid to teak, a further centralised floor locker gives you a good wine cellar in the keel. This is five feet long and houses the computer DVD player and the tilt and move mount for the TV. 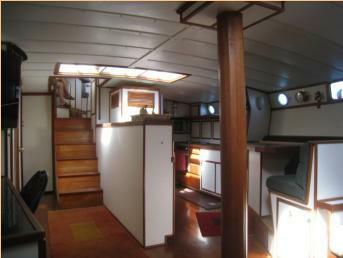 this space is perfect for planning live afloat and is in addition to the work space up top in the pilot house. 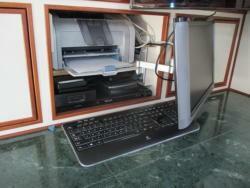 The computer hard drive and printer are stowed away leaving only the keyboard and monitor on show. The master stateroom has a queen sized bed across the aft end. This has made it easy to switch ends depending on the list of the vessel. It has a hotel quality standard-queen mattress. There are 2 storage compartments at each end of the bed and lockers beneath it. There is a good sized hanging locker for clothes, plus 8 cupboards and 5 drawers. In the bathroom there are an additional 6 cupboards. There is a step/seat to access the bed with a shoe locker under it. The master stateroom has has a ventilation/escape hatch in the deck head by the door, and two bronze 8”X 14” opening port lights in the aft bulkhead. There are six 9”x 22” fixed port lights, with 3/8” tempered glass. The two in the bathroom have been opaqued for privacy.The master bathroom has a full sized soaker tub, a vanity sink and an electric fresh water toilet. 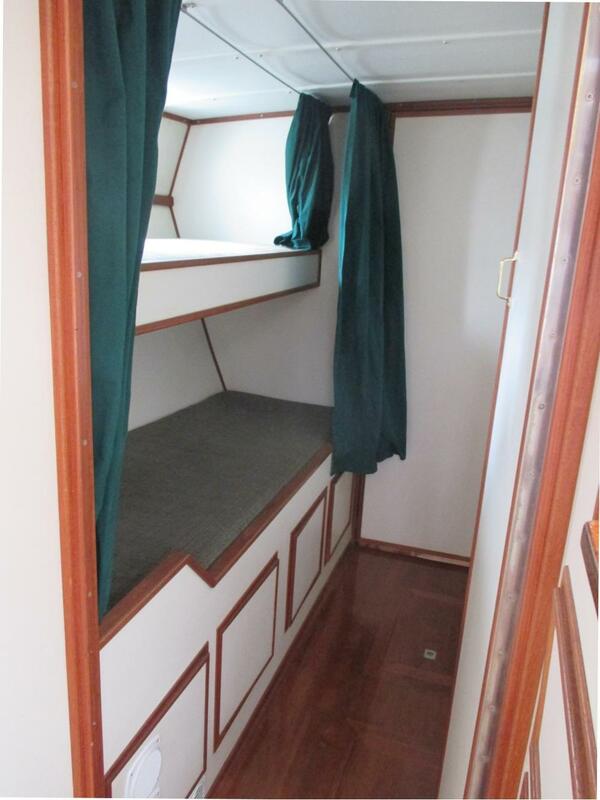 The mid-ship cabin has two single bunks.They have curtains to provide some privacy.There are 4 cupboards beneath the bunks, two large lockers under the floor and 4 more cupboards opposite the bunks. These provide ample storage for guests using this cabin. 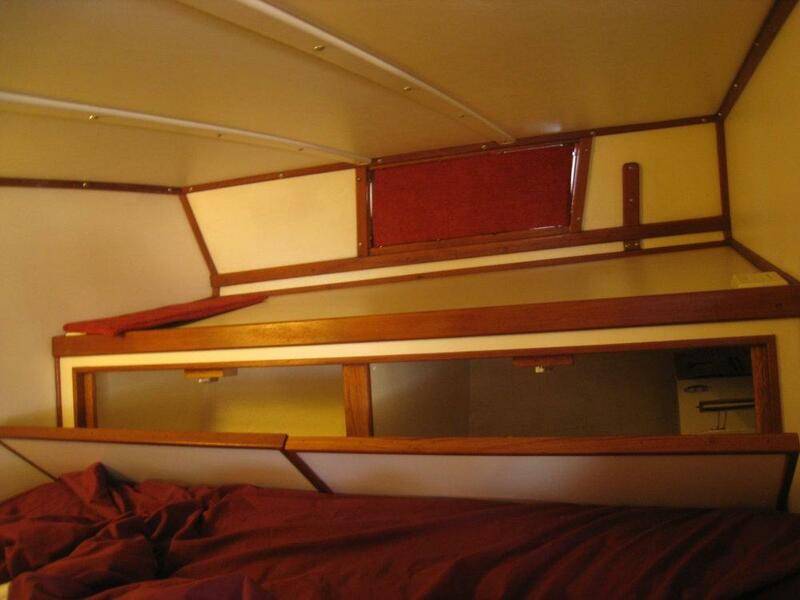 There are two opening port lights in the upper bunk for ventilation.Each bunk has a reading light and fan.There are doors at each end of the cabin/hallway which can be closed for privacy.These bunks are popular at sea. 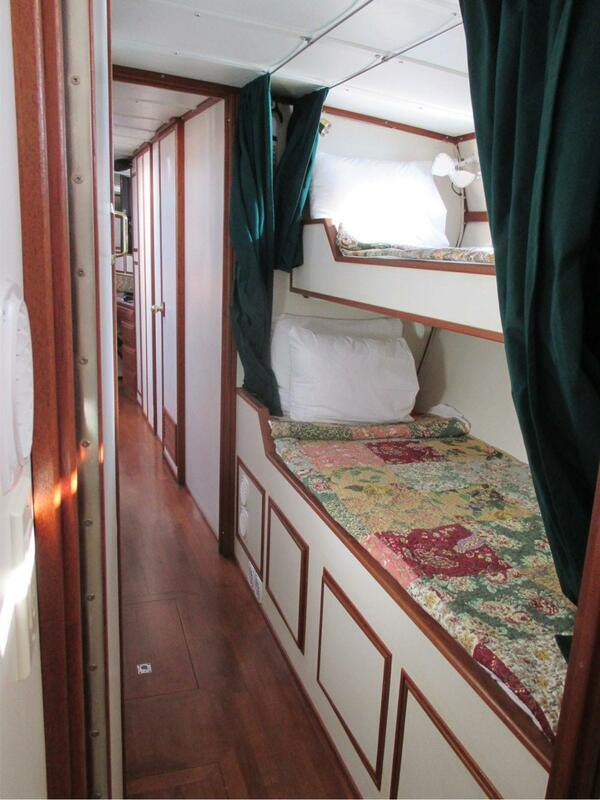 The forward cabin has a large V-berth and a single bunk. The V-berth is good for couples and the single is often use for storage. There is a large opening skylight/escape hatch through the deck which has tinted 3/8” Plexiglas. There are 2 - 8”X14” bronze port lights in the hull. There are 12v Camfro fans for each bunk. 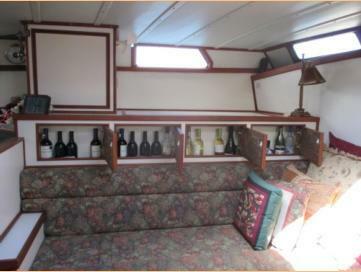 There are is a book shelf along the V-berth. 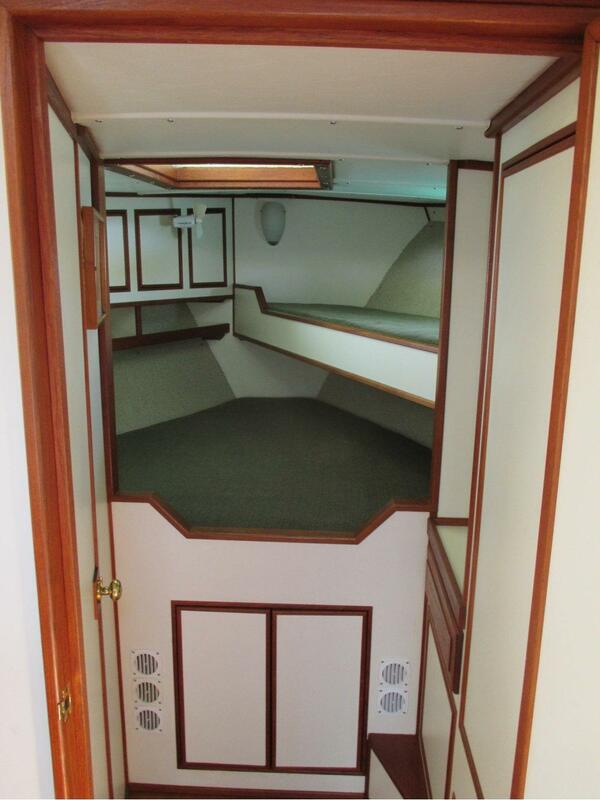 This Cabin has 10 cupboards for storage and 1 for hanging clothes.There is easy access through the floor to the hydraulic bow-thruster. Under the V-berth there is ample storage for luggage and such. The forward cabin has a hot water cabin heater with its own control thermostat. This cabin has it’s own bathroom with sink and fresh water toilet. The bathroom also has an 8” port hole for ventilation. The standing rigging consists of two aluminum masts. Both masts are painted with two part poly-urethane paint. The main mast is a single extrusion, 8” x 11” x 3/16” aluminum oval tube. It has welded on mast steps all the way to the top for easy of climbing. There are two sets of spreaders, the lower ones hold the tops of the stabilizer poles. The fittings, wires and chain plates are 316 stainless steel with bronze and SS turnbuckles. The mast is deck stepped, and sits in a 316 SS deck pad. This is supported by an aluminum compression post inside the vessel, mounted on the keel.The aft stays are two wires running to a 4”x4” aluminum square tube spreader, which is designed to keep the wires out of the walking areas alongside the pilothouse. There are a number of winches mounted on the main mast. 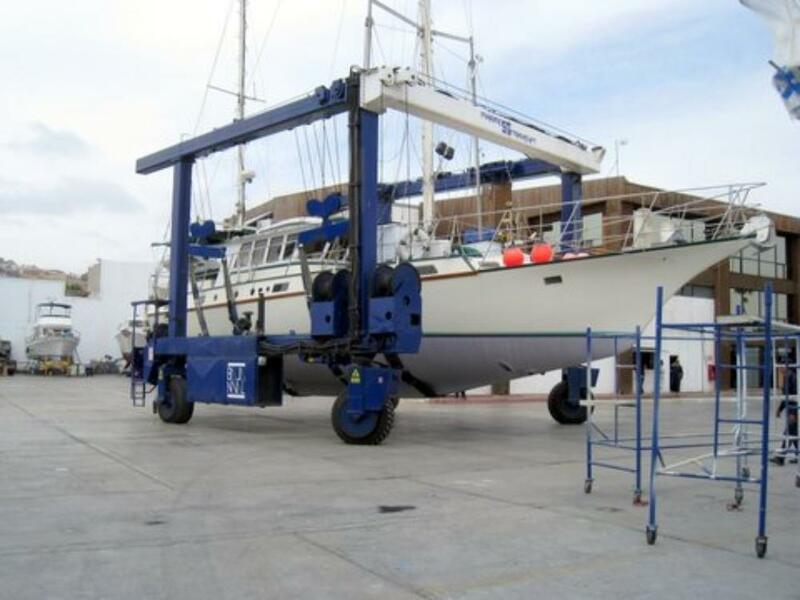 Two wire winches with 5/16 SS cable are used for lifting dingies and such or the bosun’s chair, when there is need to go up the mast for service or inspection. Both for-stays are anchored to the bow roller and have furlers on them. The main boom is 21 ft long. There is a SS boom on the front side of the main mast, which is used with it’s electric winches, for lifting the large tender in and out of the water.The mizzen mast is also a single extrusion, 6”x8” 3/16 aluminum oval tube. It also has welded on mast step all the way to the top for climbing. The mizzen boom is 16ft long. The mizzen mast hold the radio antennas, WiFi antenna, flood lights, loud hailer, etc.The sails are all furled. Both masts, main and mizzen, have outside roller furling. Hull Construction: The hull is what they refer to as a “one off”, not molded hull. It was laid up over frames and battens in an inverted position. A fine mesh was stretched and fastened to the battens to enable the initial lay-up to begin. The inside layers were constructed first, then end-grain 3/4” Balsa core was applied over this layer, followed by the build up of the outer layer. All layups were hand applied. The hull was then filled, faired and sanded to bring it to molded quality. The above water area was then painted with 2 part poly-urethane primer and paint. The under water area received an epoxy barrier coat . The nominal thickness of the hull is around 1 3/4 “. When installing thru-hull fittings the inside layer of fiberglass and the core were removed. Then the area was re-laminated with a solid resin and fiberglass buildup to ensure no ingress of water between the layers of the hulls.The ballast of concrete and lead was pored into the hull then covered over with another fiberglass buildup to encapsulate it. Tank Construction: The tanks, both water and fuel are built into the hull after hull construction was complete. The fuel tanks are built in place, and the ends and baffles were made from pre-cast 5/16 fiberglass sheets cut to the hull shape and glassed into position in the hull, after another 5/16th skin was formed in place. The lids are set into wet fiberglass and mechanically fastened with SS screws, then an addition 1/4” of fiberglass was layed up to covered the joints. This made the tank thickness at the joints 3/4” of solid fiberglass. Two inch diameter fiberglass vent and fill pipes were glassed into the lids. The tanks are very heavy construction to avoid any possibility of failure or leakage. Sumps were made in each tank at the lowest point. The fuel is drawn from there, to ensure any contamination would be immediately removed from the tank, via the filter system. Deck Construction: The deck is constructed with 3/4” marine grade plywood that is long spiced at the joints and glued together. It is supported on 2 x 2.5” glue laminated fir beams on 16” centers and mechanically fastened to the plywood. There is a layup of a full 1/4” of fiberglass on the plywood deck. There has been no de-lamination or leaks. Pilot House Construction: The pilot house is constructed of marine grade plywood, then fiberglassed, faired and painted. The pilot house was bolted to the decks , then fiberglassed to the decks. 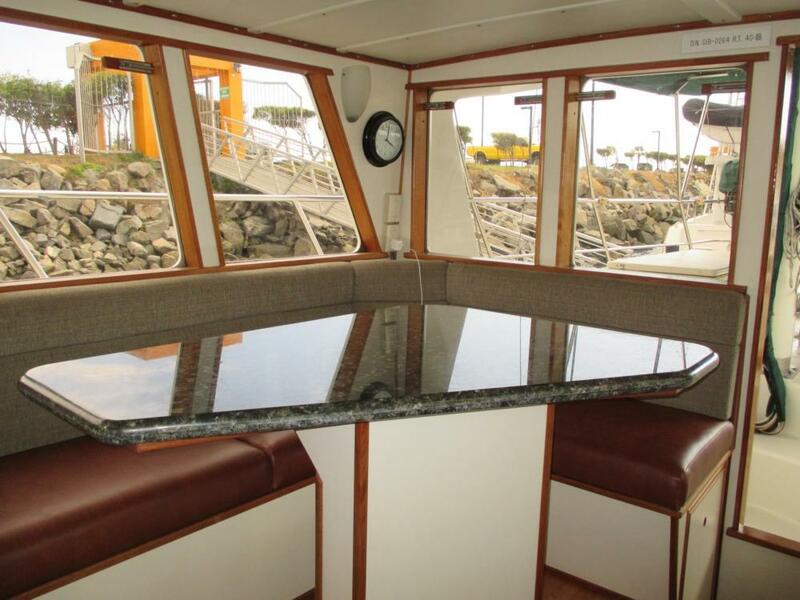 The windows in the pilothouse are all tinted tempered glass. The front windows are 3/8”, while the sides and aft windows are 1/4”. 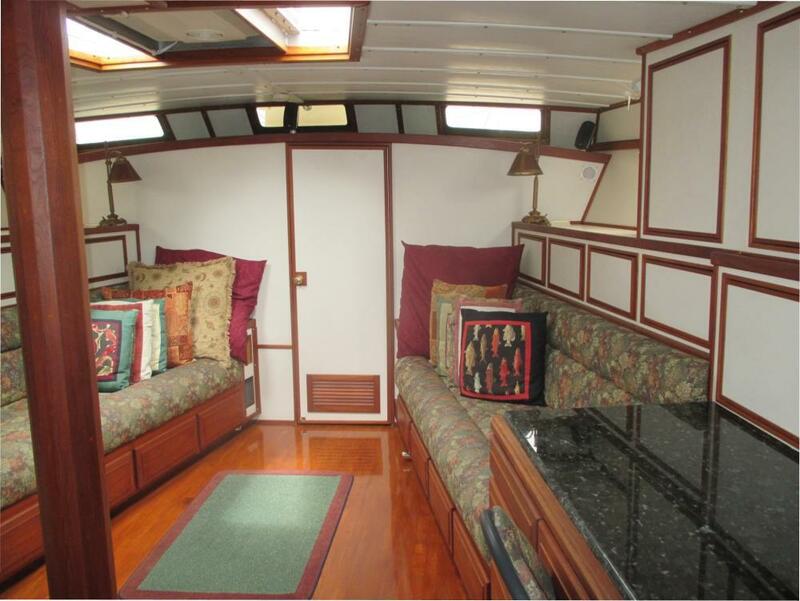 There is a self draining step-well behind the pilothouse to allow for a full sized entry door. The door is fiberglass over plywood construction. Stern Extension Construction: The stern extension was built, then later attached to the boat. 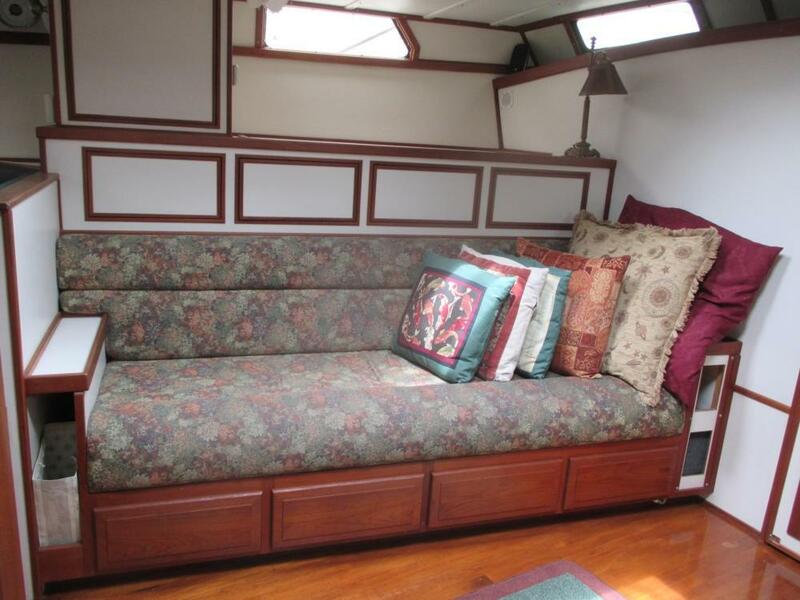 it is built of pre-cast and molded fiberglass and then attached to the transom and hull. The attachments are carefully layed up inside and out to ensure positive and complete bonding to the origin material. The integrity of the original transom was not compromised. 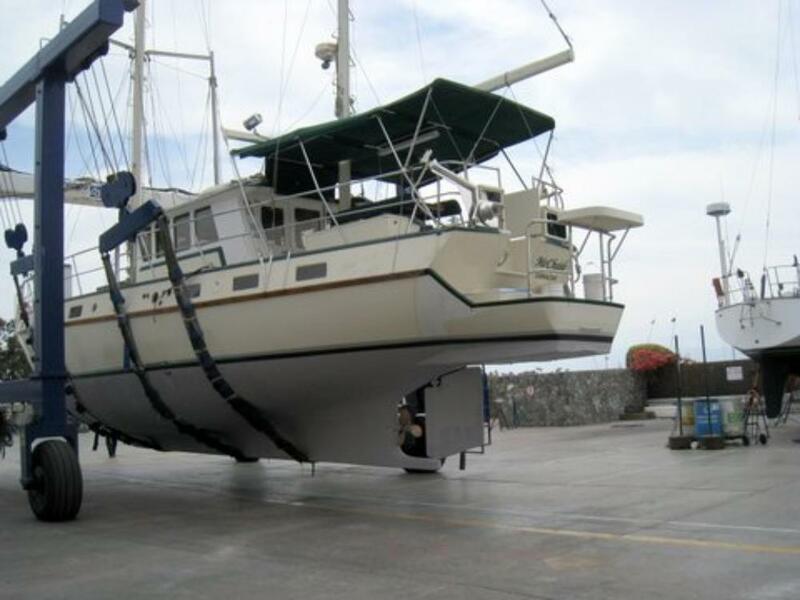 Stabilizer System: Many Questions have been asked as to “Why would you put Stabilzers on a Sailboat?”. The reason is, all boats roll on the ocean. 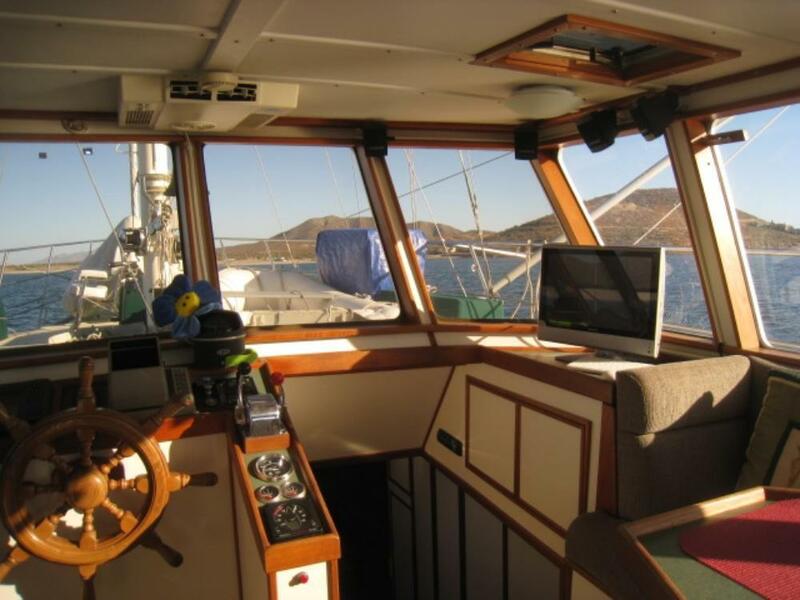 Whether you are sailing, motoring or at anchor, why would you not afford yourself to maximum comfort at all times?The system on Mo’Chuisle is refined from the experience of 30 years commercial fishing near Alaska, and 17 years as a Yacht Captain around the globe. Mo’Chuisle can sail with a 100% Jib and leave the poles out and the fish in the water. When traveling in most weather things do not fall off the table or throw you about in the galley. 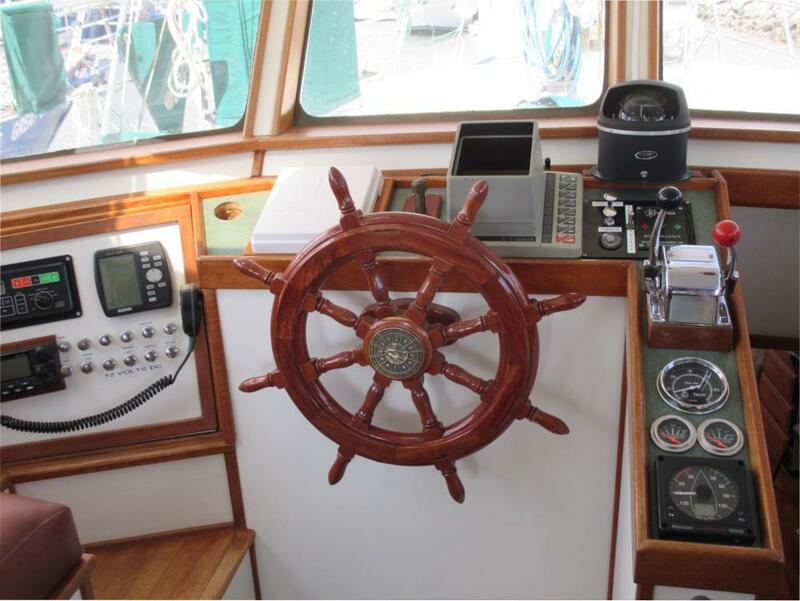 When at anchor there is no violent rolling if you get a broadside swell or waves from a passing ship. This system is easy to deploy. It is only necessary to pull the poles up, if you are going to a marina. We leave them out for months at a time when cruising. The only sacrifice is that you lose .3 to .4 Knots per/hr when the fish are deployed. Small sacrifice for the comfort provided. The stabilizer lines are run threw blocks at the end of the poles which makes it easy to vary the depth of the fish or to deploy them in a moment, should the weather come up quickly.The poles are deployed with halyards and rest on polyester/spectra safety stays when out. There are hold downs made from 1 1/4” SS tubing between the poles and the main railings.The fish are a custom design. They are made of 3/8” fiberglass, with a lead weight on the forward end and two vertical tracking fins on the aft end. They nest upright along the railing when stowed. 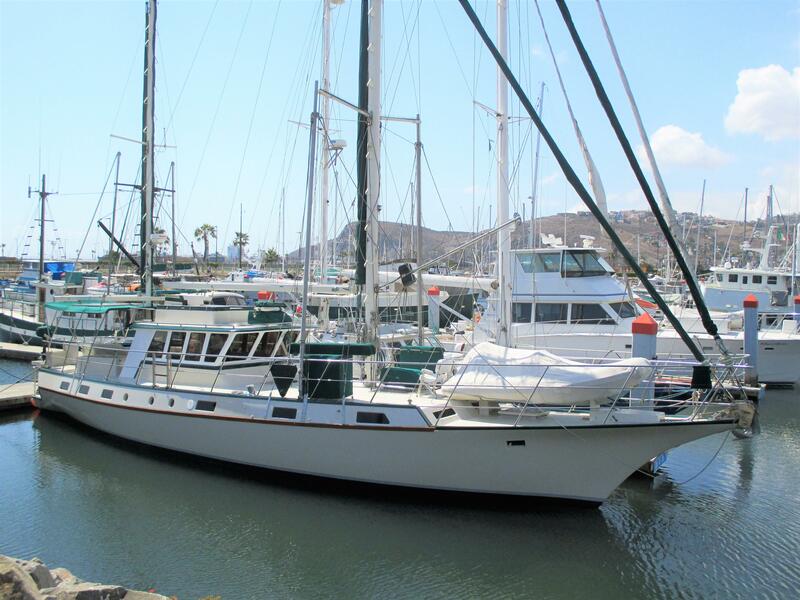 Mo’Chuisle is equipped with a Smith-Brothers aluminum drum-style hydraulic anchor winch. This winch is set into the for-deck. It holds 400 ft of 3/8” galvanized anchor chain. There is a sliding dog-clutch, which disengages the hydraulic motor allowing the drum to free wheel, for rapid deployment of the anchor. It also has a forward and reverse control valve, should one wish to set the anchor hydraulically at a slower pace. There is a custom made heavy duty SS bow roller designed to accommodate Mo’Chuisle’s 175lb/ 80KG Bruce style anchor. There is a 3/8” SS chain hook on a snubber line for use when at when at anchor.There is a 35KG CQR type galvanized anchor in the locker below the winch for a spare. There is a Fortress 55 aluminum anchor and a 45 lb SS CQR anchor stored in the pilothouse roof locker. Mo’Chuisle carries two life rafts, one is a six man Switlik raft and the other is a four man Dunlop-Beaufort. 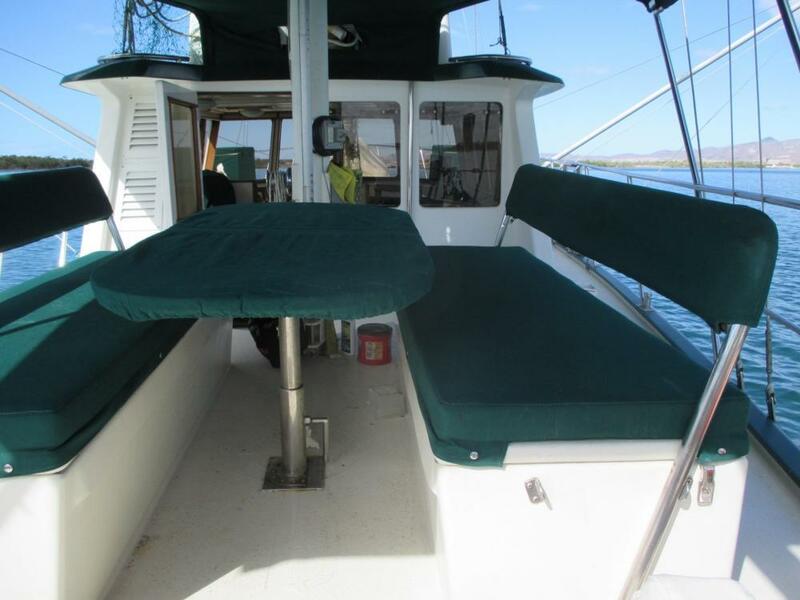 The Switlik is in a locker on top of the pilothouse and the Dunlop-Beaufort is in a locker in the pilot house next to the door, for easy access on the way out..There are the required amount of life jackets also in the pilothouse roof locker. There is also a Para-Vane parachute drogue, for drifting in storm conditions. This has never been deployed. There is a round life ring with heaving line and a horseshoe life ring, also with a heaving line. There are also two tenders that can be used for emergency evacuation. Inside Mo’Chuisle there are two carbon monoxide detector/smoke alarms. There are 6 fire extinguishers through out the vessel in appropriate easy to access places. Four are 2.5lb ABC and two are 5lb ABC.The main engine is equipped with safety alarms and the generator with auto shutdown switches. 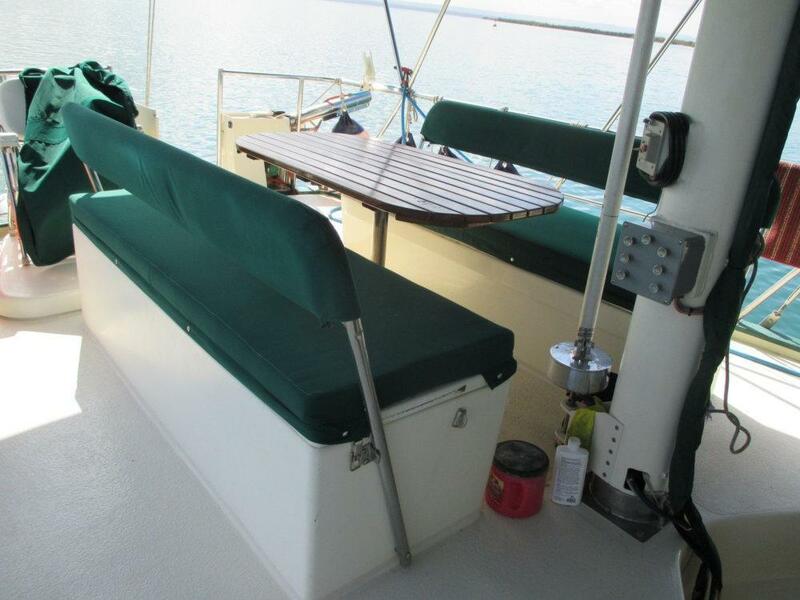 The deck railings are 35inch high, rigid SS tubing for safety at sea. Mo’Chuisle carries a personally registered GPS emergency locating transmitter beacon. There are escape hatch/skylights in the salon and the forward and aft cabins. There is also an emergency escape door from the engine room to the pilot house. 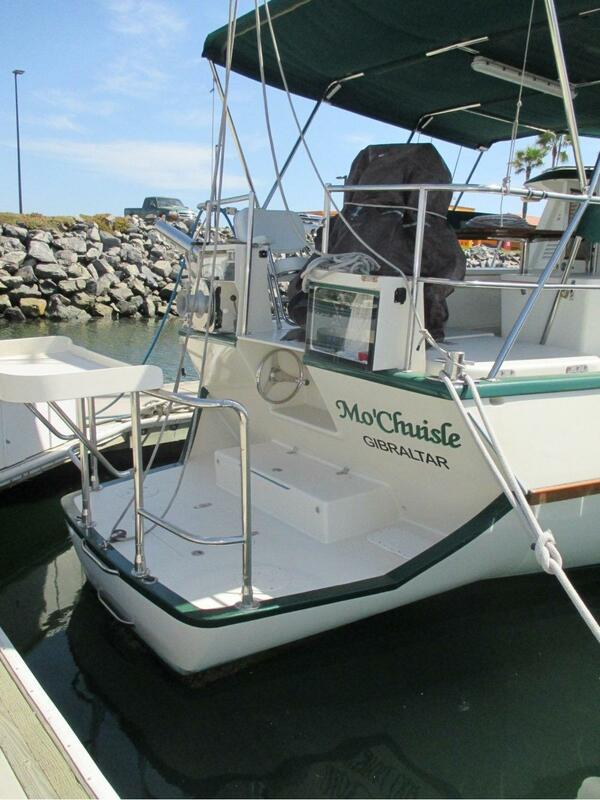 Mo’Chuisle is equipped with a 12 volt DC system and a 120 volt AC system. The vessel is wired predominately 120 volt AC to accommodate modern needs and standard North American electrical appliances. There are plug-in receptacles through out the vessel within arms reach of the next. 12 Volt System: There is a 12 volt Heart Freedom 2500 watt inverter/battery charger suppling 120 volts AC, with a sub-breaker panel to supply the low amperage 120 volt needs. It has an automatic transfer switch that senses when it receives input voltage and turns the inverter into a 130 amp 3 stage battery charger. A spare inverter is mounted right beside the operating one. Should the present one fail and you need to move the wires over to the spare, this is easily accomplished.The higher amperage 120 volt items are run through the main breaker panel, which is supplied from either shore power, or generator power.The 12 volt system powers navigation equipment, engine room equipment, toilets, radios, fans, and LED deck lights. It is powered by two separate 820 amp/hr Surrette/Rolls battery banks. There are two 130 amp large case alternators on the main engine. These are combined through a Balmar Max Charge MC-612 Regulator. ( a spare regulator is mounted right beside the operating one, should it fail and you need to move the wires over to the spare) There is a field interrupt switch in the dash, which allows you to turn off the alternators, when using the hydraulics. 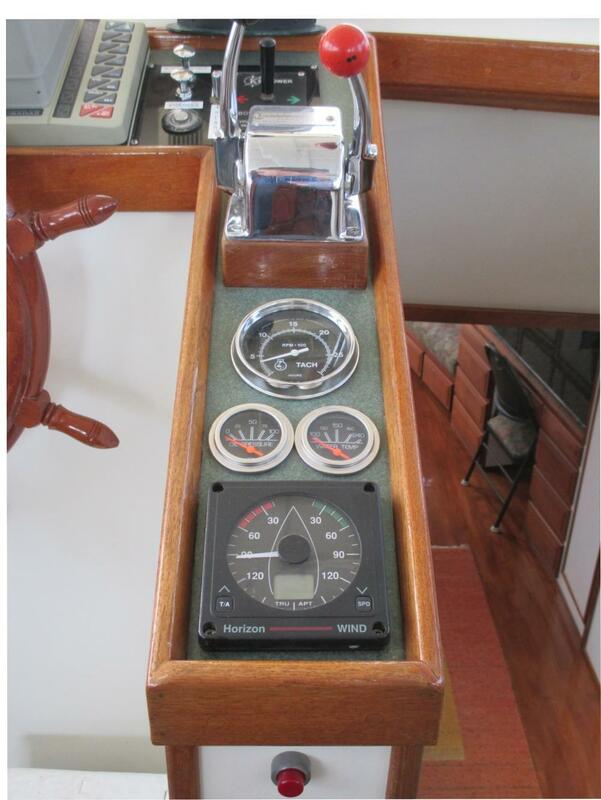 This can be necessary when the engine is cold and you wish to use the Anchor Winch or the Bow Thruster while the batteries are demanding a heavy input. The 12 volt starter has its own battery switch, so you can choose which battery bank you wish to use, or combine both banks. The system is monitored through a Heart Link 2000R battery monitor.There are solar panels above the aft deck canopy, which aid in charging the batteries, these are run by a Blue Sky Solar Charge Controller. These will run the main fridge if you are away from the vessel. 120 Volt System: Most light use items are run through the inverter. For heavier amperage items, there is a 6KW Northern Lights diesel generator. This generator has a 50 amp output, which is more than adequate for running the systems aboard. You can charge the batteries and make 30 gals water per/hr at the same time, with only a 30 amp load and a 1.3 liter per/hr fuel consumption.There is a Smart Plug 50 amp shore power connection and a 75ft 6/3 shore power cord, to guarantee minimal line loss from the shore power to the vessel. This is connected to a 5KVA isolation transformer, which can receive or output 120 or 240 volts in any combination. This completely isolates the vessel electrically from the shore power and has proven invaluable in preventing electrolysis.There is an 120 volt AC sub-panel under the dash to run outside flood lights and plug-ins, as well as pilothouse receptacles.Mo’Chuisle has utilized many modern household appliances, which are usually designed better, function better, and last longer than most “marine specific” items. They are usually easier and less expensive to replace. 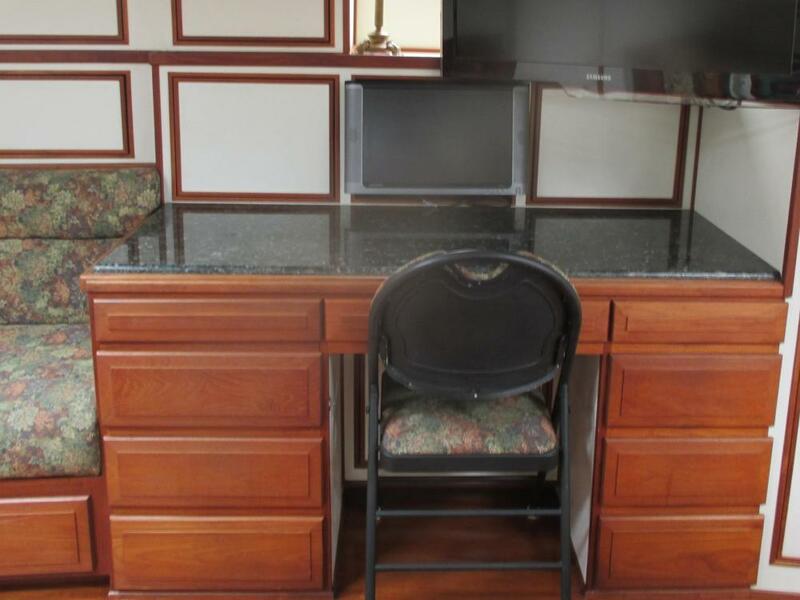 These include fridges, freezers, computers, microwaves, washer and drier, air conditioners, ice machines, televisions, lights, etc. We just haven’t had any issues with them over the years.There is a receptacle in the stern to plug a Honda EU2000 generator(or similar generator) directly into the inverter/battery charger as another back up system. powered by a six cylinder Isuzu 6BG1 diesel engine. This is a 114 continuous hp engine @ 2500 rpm. The normal cruising rpm is around 1650 rpm which utilizes 80 continuous hp for 7.3 knts. The main engine is coupled with a Borg Warner Velvet Drive Transmission, Model 10-18 with a 2.1 to 1 ratio . Mo’Chuisle has a 1 3/4” SS shaft approximately 10ft long, with a 24 x 17 left hand bronze propeller. A PYI drip-less shaft seal is coupled to the Fiberglass shaft tube, which has two sleeve style water cooled cutless bearings inside. There is a shaft brush connected to a zinc on the hull exterior to aid in reducing electrical interference and provide added electrolysis protection to the shaft and propeller. There is a hydraulic disc-brake mounted between the couplings, that is released when the engine starts, and engages when the engine is stopped.